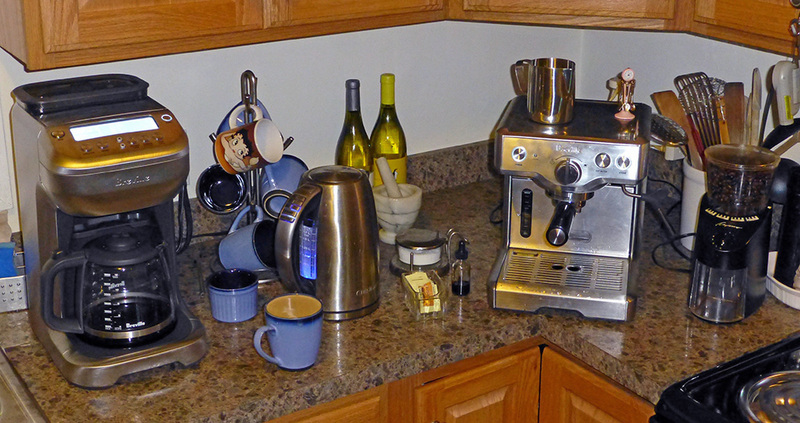 The coffee, espresso, and tea corner of my kitchen is now complete after I replaced my older model Cusinart Grind & Brew drip coffeemaker with a fancy-schmancy Breville version that does an even better job – plus, it can do single cups of whatever size I want. I’d been using the Cuisinart for about fifteen years, keeping a US$40 refurb or two in the wings throughout that time to immediately replace units when they’d inevitably die after about 750 cycles – usually a failure of the warming plate. My best mate got me my first one for my birthday around 1999, something I will be eternally grateful for. I’ve enjoyed a lot of damned good coffee thanks to her. The initial incarnation of the Breville YouBrew released several years ago had a metal thermal carafe, but I wasn’t all that interested due to many reviews complaining of weak and lukewarm coffee. 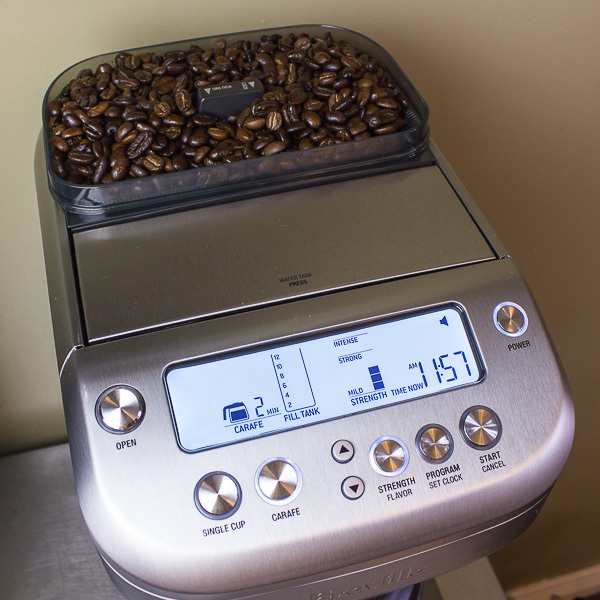 The machine had a ceramic burr grinder, generally considered to be the best sort, but wasn’t grinding the beans fine enough, and the carafe required preheating in order for coffee to stay warm. The latter is an un-feature for me since I program my drip maker to start at 6am weekdays. I’m not going to get up fifteen minutes before that to warm a carafe. A couple years ago, finally they did something about both problems: They released a different model with a more traditional glass carafe and warming plate and improved the grinder on both models to produce a finer grind. The chief complaint one reads about nearly all grind & brew machines from all manufacturers is dishwater-weak coffee because the grinders most often are blade grinders and produce a coarse grind more suitable for French press coffee than drip. The Cuisinart I used didn’t have that problem even though it had a cheaper blade grinder, and always produced nicely strong coffee. I once foolishly replaced it with a Mellita Grind & Brew machine and was stuck with dishwater coffee for a week or two until I could find another refurbed Cuisinart. Later Cusinart grind & brew models did suffer from the feeble strength syndrome, so I always stuck with the original DGB-300 model. Over the years, Cusinart-refurbished ones eventually dropped to as low as US$35-40 on Amazon, but started becoming scarce once Cusinart stopped making this model four or five years ago and are now gone altogether. I knew I’d eventually have to come up with a replacement. After using the Breville for two weeks now, I can report that it’s terrific. I have its strength setting two marks below the maximum and the resulting brew is still slightly stronger than the old Cuisinart. 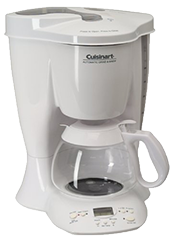 The coffee is plenty hot, strong, and has the same 10-11 minute brewing time of the Cuisinart. Delightful. Some advantages over the Cuisinart are much easier cleaning – instead of thoroughly washing three fiddly components, you just rinse the basket assembly and sponge any grounds off a disc behind the basket that autorotates to seal off the grinding chute during the brew cycle – and a carafe pour spout design that doesn’t drip off to the sides and onto your countertop as you pour. Here’s a video showing most of the YouBrew Glass features. I think I watched this about eight times in the last couple of years in anticipation of finally owning one.